For those who colour outside the lines, feel life is best lived outside the box, and heed “caution, curves ahead” as a challenge rather than a warning…backcountry skiing is meant for you. Golden, B.C., is one of the best destinations for backcountry, slackcountry and sidecountry skiing in the country. Not just because of the cushiony snow or the diverse terrain, or its proximity to Roger’s Pass, Canada's ski touring Mecca; but also thanks to the tour guides, alpine lodges and variety of activities that make it a unique and tempting destination. Perhaps the best part of backcountry skiing in Golden is the ability to personalize your experience. There’s a right and a wrong way to do it, and we’re here to steer you on the right path to getting off-piste. Don’t come in blind—alpine touring isn’t something you can just “show up” for. Avalanche precautions must be taken, weather conditions should be carefully monitored and everyone in your group must be outfitted with the correct and reliable safety equipment. Plan, research and book your trip well in advance. If it’s your first time, you should definitely go with a guide. Luckily, there are several options for guided backcountry experiences in Golden. You can book a fully certified private tour or join a small group. Want to do it independently? Rent gear and talk shop with knowledgeable local outfitter Higher Ground Mountain Sports before setting out. Wedges of white snow border the front door of your private timber frame cabin. Inside, a blazing log fire warms the hearth, spreading warmth to the rest of the room. Your bedroom is tucked behind the rustic kitchen; a plaid quilt and fluffy pillows caress your exhausted body after a long soak in the outdoor hot tub beneath the stars. The noisy, traffic-infested, exhaust-riddled city, with its deadlines and high-rises, has never seemed so far away. 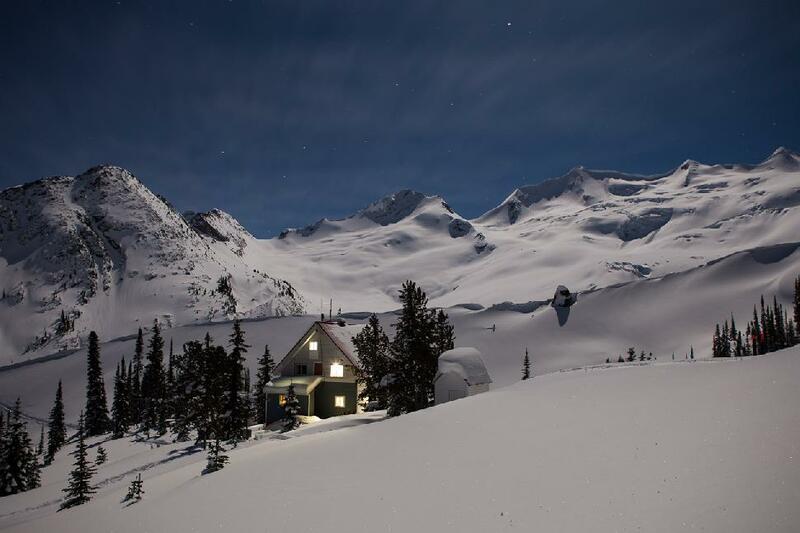 A backcountry skiing experience would not be complete without a stay at one of Golden’s over 20 backcountry lodges. From self-catering to full-service, the scenic cabins scattered through the mountains are a welcome haven to return to after a long day of backcountry skiing. Bonus: If some members of your group aren’t keen to ski, they’ll still want to come along for the experience of staying in a luxurious (or rustic!) backcountry lodge. Golden has two heli-skiing operations, one cat skiing company and three main snowmobiling zones. Purcell Heli-Skiing has been in operation since 1974, making it one of the oldest operations of its kind in North America. It has always been a fully family run company. Great Canadian Heli-Skiing offers unlimited vertical to small groups of no more than four, which makes them stand out from competitors. Their heli-ski packages range from 2 to 10 days and include rooms with mountain views and powder-specific equipment. Chatter Creek is a premiere destination for cat skiing. The snow is deep and the terrain is steep, just like it should be. A typical day starts with fresh baked bread and gourmet coffee, and ends with a relaxing massage, a cold beer and a soak in the hot tub. Adrenalin Descents has access to over 11,000 hectares of terrain by snowmobile, providing years of new backcountry adventures. They offer overnight and multi-day winter camping backcountry ski experiences. A large expedition tent heated by a wood stove is the centre of their cozy, Artic-style basecamp. Tour: Roger’s Pass is known as the birthplace of alpinism in North America. The varied terrain means it can take a bit more work to get your turns in, especially from A.O. Wheeler Hut, but the reward is an untouched oasis of deep snow. Access points vary, but staying in one of the quaint, secluded cabins is the best way to go. Lodge: The Alpine Club of Canada (ACC) has a wide collection of family-friendly huts located in alpine meadows, with access to excellent rock climbing and backcountry powder. Asulkan Cabin is a cozy ski hut tucked away in Asulkan Valley in Roger’s Pass. It is a great place to get your turns in, but getting there requires a hefty 4-hour ski. A.O. Wheeler Hut is a short 2-kilometre jaunt from a parking lot. There are two wood stoves, propane for cooking and lighting, and enough room to sleep 30 of your closest ski buddies. Daily Routine: Wake up when you want, hit the powder when you want, come home when you want. 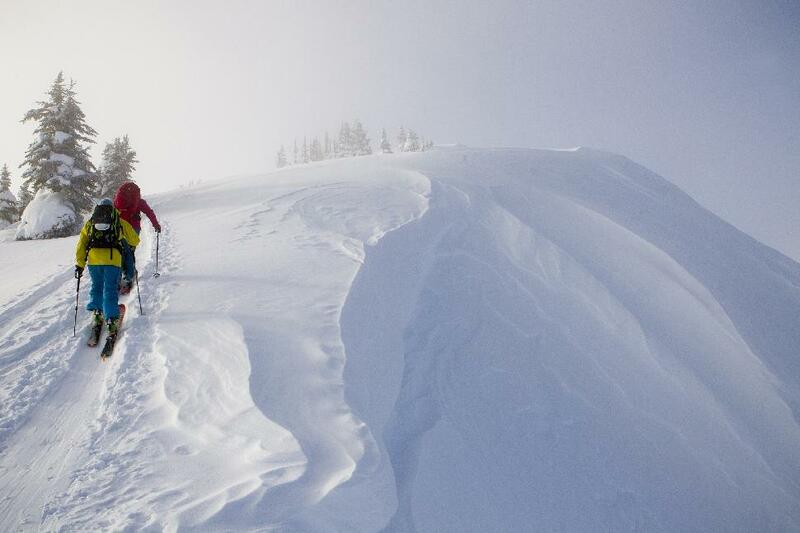 ‘Tis the beauty of self-guided backcountry skiing! Tour: The northern Purcell Mountains, perched on the eastern border of Glacier National Park, are a world-class playground for powder-chasers. 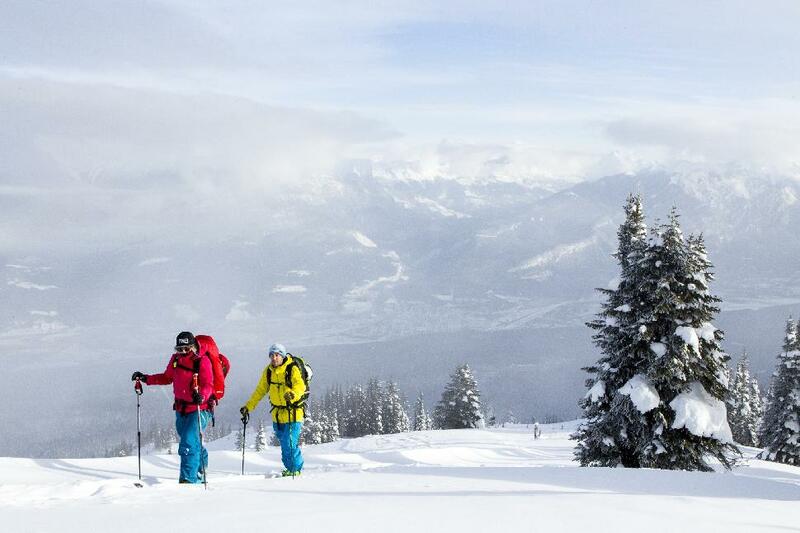 The terrain has options for all skill levels, including steep tree skiing and open bowls with 600-metre descents. Lodge: Purcell Mountain Lodge. 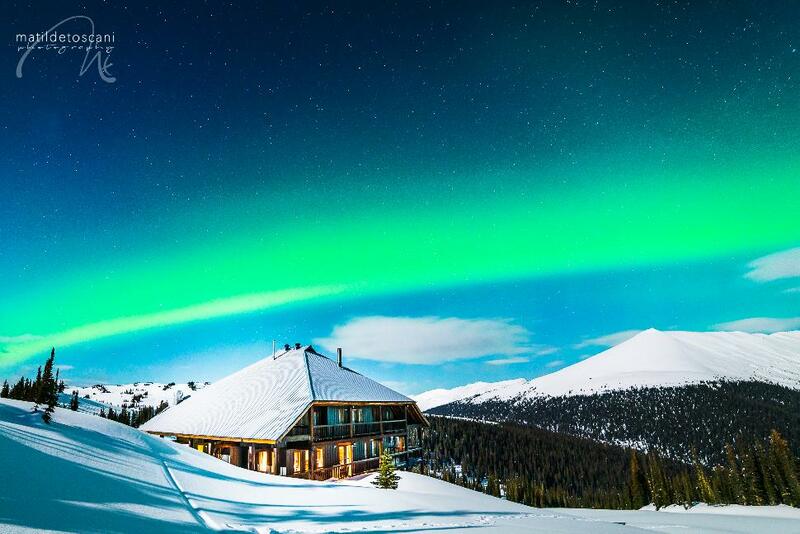 Just a 15-minute helicopter ride from Golden, this luxury lodge has been nicknamed the “Island in the Sky.” Groups of up to eight can rent the private chalet, which is detached from the main lodge. For an extra fee, your tight-knit group can hire their own private guide. Non-skiers need not stay at home. Snowshoeing abounds just out the front door of the lodge. Chalet guests enjoy access to the main lodge's amenities. A cozy living room and quiet library invite bookworms and a cedar wood-burning sauna deserves a daily visit. Tour: Mistaya Lodge is beloved as a small family-based business nestled just below tree-line on the western slopes of the Rocky Mountains in the Wildcat Creek Basin. Vacation packages include helicopter flights from Golden to Mistaya Lodge, all home-cooked meals, accommodation and professional guiding. Powder hounds rejoice. The lodge's location enjoys a unique advantage: moisture-laden storms are forced up and over the mountains, dropping frequent and abundant snowfall all winter long. The glaciated terrain and open tree skiing is suitable for intermediate to advanced backcountry skiers. Lodge: Helicopter access only means a true alpine retreat. A cozy post and beam, eco-lodge accommodates up to 14 guests in a mix of shared and private double accommodation. The lodge is powered by solar and a small micro hydro-electric unit. There is a wood-fire sauna/shower, a sitting room with a small library, and a large boot room to dry all your gear. All meals are cooked and baked fresh daily by the in-house cook, so all you have to do is enjoy. 6 a.m.: Wake up to the smell of coffee. Get your gear together for an epic day. 8 a.m.: Fuel up with an elaborate two-course breakfast. 9 a.m.: Pack up your lunch and head out for the day. 4 p.m.: Return to the lodge for happy hour and take your turn in the sauna. 6 p.m.: Share stories from the day over a healthy three-course dinner. 8 p.m.: Relax, read a book, and have sweet dreams of the next days’ turns! Need help planning your trip to Golden?